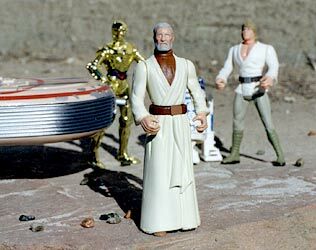 This is Obi-Wan without his brown outer cloak. I used a POTF Obi-Wan torso and head, POTF Tatooine Luke arms, and POTF Emperor legs. For the legs I had to shave off part of the front that overlaps the belt. Then I made a belt buckle out of sheet styrene. The robe color was painted with Poly Scale Israel Early Light Grey.